Promote a safer workplace. The patented, molded-in WaveBrake inhibits wave formation, which reduces splashing by 40%. Buckets stack, even with the wheels attached, for more efficient storage. Tested to exceed 50,000 cycles, the wringers are more than twice as durable. 30° handle bend is easier on the user’s wrist and shoulder. 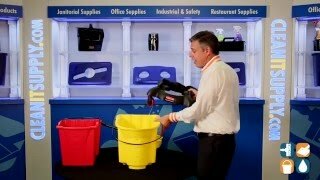 Reduces cross-contamination with it's unique “bucket-in-bucket” design that separates clean and dirty water. 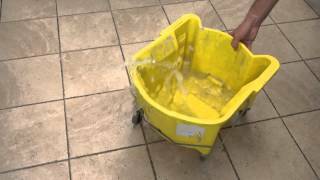 This reduces cross-contamination potential and leaves a cleaner, less slippery floor. Sideward pressure wringer. 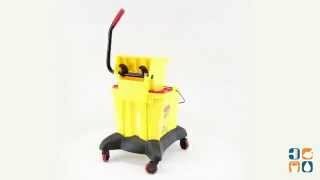 Generating less than half the noise of a traditional mop bucket, the Quiet Caster Dolly allows you to work quietly in noise-sensitive environments, day or night. Bucket capacity: 35 qt. Wringer capacity: up to 32-oz. mops.